A kiva is a special purpose building used by Ancestral Puebloan (previously known as Anasazi) people in the American southwest and Mexican northwest. The earliest, and simplest, examples of kivas are known from Chaco Canyon for the late Basketmaker III phase (500–700 CE). Kivas are still in use among contemporary Puebloan people, as a gathering place used when communities reunite to perform rituals and ceremonies. A kiva is a ceremonial building used by Ancestral Puebloan people. The earliest are known from Chaco Canyon about 599 CE, and they are still used today by contemporary Puebloan people. Archaeologists identify ancient kivas based on a series of architectural characteristics. They can be round or square, subterranean, semi-subterranean, or at ground level. A sipapu in a kiva is a small hole thought to represent a door to the underworld. Prehistorically, there was typically about one kiva for every 15 to 50 domestic structures. In modern pueblos, the number of kivas varies for each village. Kiva ceremonies today are mainly performed by male community members, although women and visitors can attend some of the performances. Among Eastern Pueblo groups kivas are usually round in shape, but among Western Puebloan groups (such as Hopi and Zuni) they are usually square. Although it is difficult to generalize across the entire American southwest over time, kivas likely function(ed) as meeting places, structures used by subsets of the community for a variety of socially integrative and domestic activities. Larger ones, called Great Kivas, are larger structures typically built by and for the whole community. They are typically greater than 30 m square in floor area. 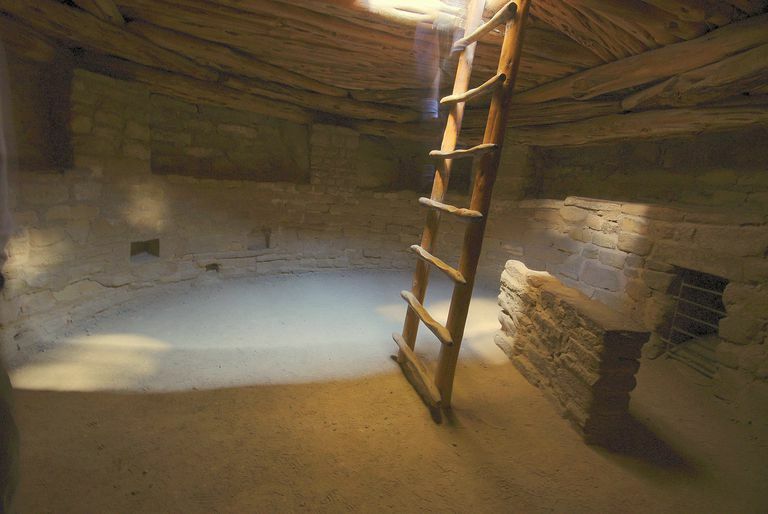 When archaeologists characterize a prehistoric structure as a kiva, they typically use the presence of one or more of several distinguishing traits, the most recognizable of which is being partly or completely underground: most kivas are entered through the roofs. The other common traits used to define kivas include deflectors, fire pits, benches, ventilators, floor vaults, wall niches, and sipapus. ventilator shafts oriented toward the east: all subterranean kivas need ventilation to be bearable, and roof ventilation shafts are typically oriented to the east although south-oriented shafts are common in the Western Anasazi region, and some kivas have second subsidiary openings to the west to provide increased airflow. These features aren't always present in every kiva, and it has been suggested that in general, smaller communities used general use structures as occasional kivas, while larger communities had larger, ritually specialized facilities. The main identifying characteristic of a prehistoric kiva is that it was built at least partly underground. This characteristic is linked by archaeologists to earlier subterranean but (mainly) residential pithouses, which were typical of ancestral Puebloan societies prior to the technological innovation of adobe brick. The changeover from subterranean houses as domestic residences to exclusively ritual functions is central to pithouse to pueblo transition models, associated as it is with the innovation of adobe brick technology. Adobe surface architecture spread across the Anasazi world between 900–1200 CE (depending on the region). The fact that a kiva is subterranean is not a coincidence: kivas are associated with origin myths and the fact that they're built subterranean may have to do with an ancestral memory of when everyone lived underground. Archaeologists recognize when a pithouse functioned as a kiva by the characteristics listed above: but after about 1200, most structures were built above ground and subterranean structures stopped including features typical of a kiva. The debate centers on a handful of questions. Are those pithouses without kiva-like structures built after above-ground pueblos were common really kivas? Can it be that kivas built before above-ground structures are simply not being recognized? And eventually—is how archaeologists define a kiva truly representing kiva rituals? As has been noted in several ethnographic studies, kivas are primarily places where men congregate. Anthropologist Jeannette Mobley-Tanaka (1997) has suggested that women's rituals may have been associated with mealing houses. Mealing rooms or houses are subterranean structures where people (presumably women) ground maize. The rooms held artifacts and furniture associated with grain grinding, such as manos, metates, and hammerstones, and they also have corrugated pottery jars and bin storage facilities. Mobley-Tanaka noted that in her admittedly small test case, the ratio of mealing rooms to kivas is 1:1, and most mealing rooms were located geographically close to kivas. In Chaco Canyon, the better-known kivas were constructed between 1000 and 1100 CE, during the Classic Bonito phase. The largest of these structures are called Great Kivas, and large and small-sized kivas are associated with Great House sites, such as Pueblo Bonito, Peñasco Blanco, Chetro Ketl, and Pueblo Alto. In these sites, great kivas were built in central, open plazas. A different type is the isolated great kiva such as the site of Casa Rinconada, which probably functioned as a central place for adjacent, smaller communities. Archaeological excavations have shown that kiva roofs were supported by wooden beams. This wood, mainly from Ponderosa pines and spruces, had to come from a huge distance since Chaco Canyon was a region poor of such forests. The use of timber, arriving at Chaco Canyon through such a long-distance network, must, therefore, have reflected an incredible symbolic power. In the Mimbres region, great kivas began to disappear by the mid-1100s or so, replaced by plazas, perhaps a result of contact with Mesoamerican groups on the Gulf Coast. Plazas provide public, visible space for shared communal activities in contrast to kivas, which are more private and hidden. Crown, Patricia L., and W. H. Wills. "Modifying Pottery and Kivas at Chaco: Pentimento, Restoration, or Renewal?" American Antiquity 68.3 (2003): 511–32. Print. Gilman, Patricia, Marc Thompson, and Kristina Wyckoff. "Ritual Change and the Distant: Mesoamerican Iconography, Scarlet Macaws, and Great Kivas in the Mimbres Region of Southwestern New Mexico." American Antiquity 79.1 (2014): 90–107. Print. Mills, Barbara J. 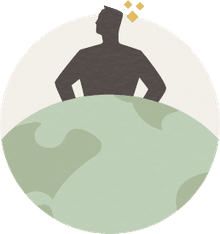 "What’s New in Chaco Research?" Antiquity 92.364 (2018): 855–69. Print. Mobley-Tanaka, Jeannette L. "Gender and Ritual Space During the Pithouse to Pueblo Transition: Subterranean Mealing Rooms in the North American Southwest." American Antiquity 62.3 (1997): 437–48. Print. Schaafsma, Polly. "The Cave in the Kiva: The Kiva Niche and Painted Walls in the Rio Grande Valley." American Antiquity 74.4 (2009): 664–90. Print.